Hello. 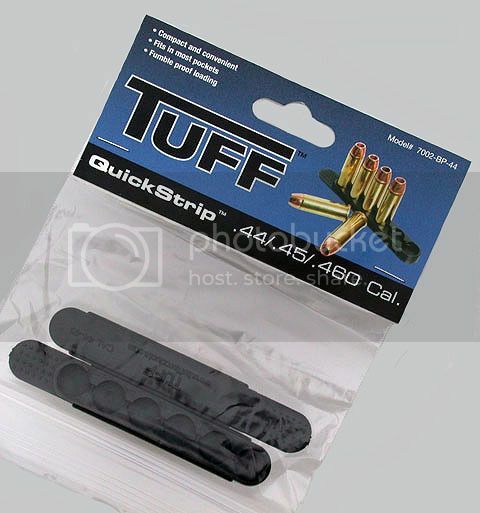 On Feb. 23rd, I ordered four packages of Tuff Products' "Quick Strips" for .44/.45/.460 and .410 Shotgun at $8.49 per pack. I did this on-line and communication and purchase verification were 1st-rate. My order arrived in today's mail, four days since the order was placed. Like many here, I've used Bianchi's excellent "Speed Strips" with my .38/.357 revolvers but until recently didn't know of any similar products for my heavier caliber wheelguns. The Quick Strips are very, very similar in appearance to the better-known Speed Strips. Shown are two Tuff Products Quick Strips. The front one is holding Winchester .44 Special Silvertips. The rear is loaded with Speer .45 Colt Gold Dots. Neither caliber was difficult at all to load into the Quick Strip. I carried 4-strips around for 5 hours. Two were loaded with .44 Specials and two with .45 Colt. I put one strip of each caliber in my front pant pockets and one of each in my two hip pockets. One round of .44 Special came loose from the Quick Strip in my left front pocket. This was not a surprise as I've had the same thing happen now and again with Bianchi's Speed Strips in the past when they were just stuck in a pocket. More of us are probably familiar with Bianchi's Speed Strip (front) than the Tuff Product's Quick Strip (rear). The Speed Strip is loaded with .38 Special and the Quick Strip, .45 Colt. These Quick Strips are by necessity larger and therefore slightly less convenient that the Speed Strips in my opinion. I emphatically am NOT saying that this is any sort of major problem. The Quick Strips worked exactly as the Speed Strips have for years. They have the same "feel" when doing this as have the Speed Strips in my admittedly subjective observation. I found them neither harder or easier to use. If you can use a Bianchi Speed Strip, I'll bet you can use the Quick Strip with the same efficiency. 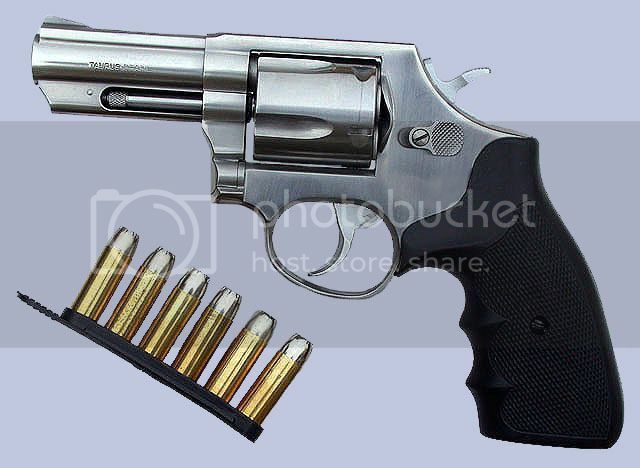 When I carry a revolver like this Taurus Model 431, I've always carried at least one HKS Speedloader with it. 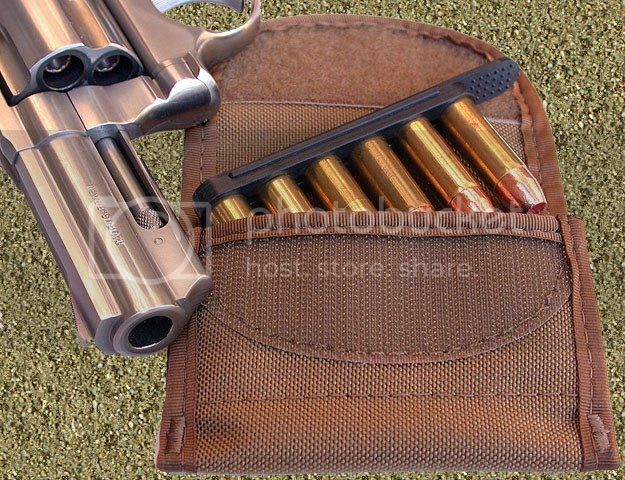 It's nice to have a choice for large-caliber revolver shooters can now tote extra ammunition via a Quick Strip instead or in addition to a speedloader. Though I didn't photograph them, the Quick Stop also works with .45 Auto Rim. I am not associated with Tuff Products in any form or fashion other than this purchase already mentioned. How well do they work for loading a Blackhawk or SAA? Hello. That I could not say as I do not own a single-action revolver. Hello. Recently an order I placed for Tuff Products' carrying pouches for their Quick Strips came in. Both of these nylon pouches can carry either one or two of the larger caliber Quick Strips. They can be had in your basic black or "coyote brown". Tuff Products didn't spare either the thread or the velcro when creating these ammunition-carrying pouches. 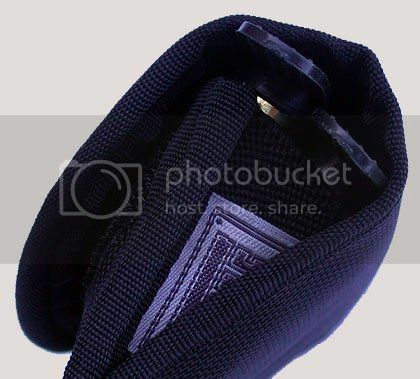 The Tuff Products' Quick Strip pouch covers use very generously-sized velcro closures. These are just not likely to be a problem accidentally opening. They do make that "velcro sound" for lack of a better description, when being opened, but I'm just not sure that there is a way around that! (Stitching beneath the the opened cover is also visible in this picture. These pouches should be plenty tough enough for continuous long-term use. 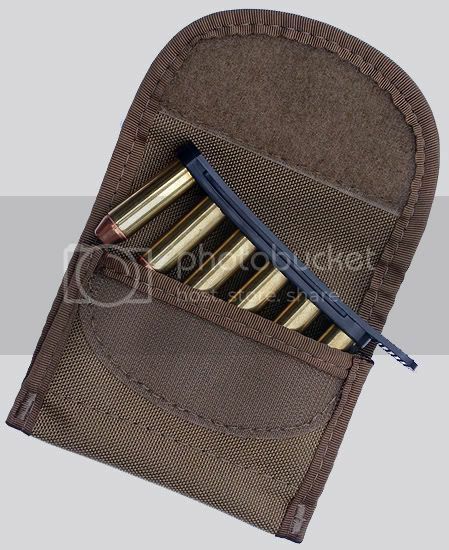 )The pouch in this picture is holding a single strip of .44 Special ammunition, though it is capable of holding two. A full-capacity "load" for the Tuff Products' Double Quick Strip Pouch is indeed two strips, each with six rounds but two more loose rounds can be carried in what the company calls "a secret pouch on the inside bottom"! In this picture, you can see the two elastic pouches in which each Quick Strip fits. Here is a view of the double pouch from the side. 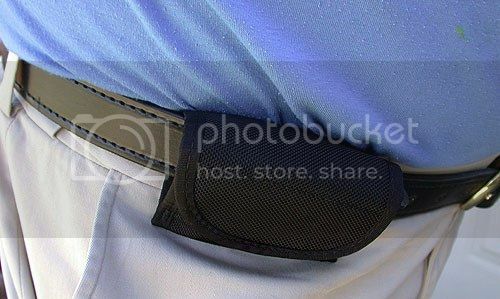 Here is how the double pouch appears on the belt. It will fit belts up to 2" in width according to the company's literature. The belt in the picture is from Mitch Rosen as made for Dillon Precision. 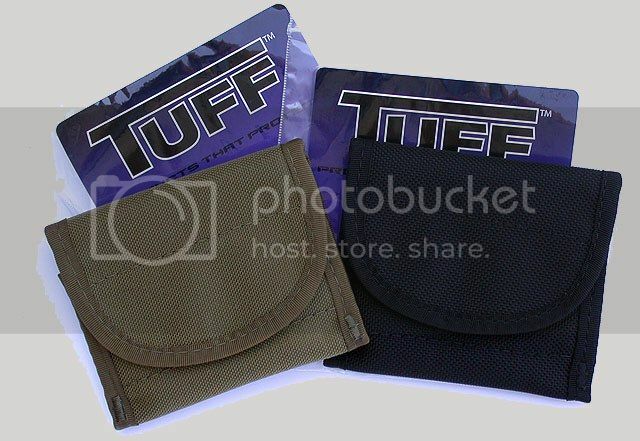 The Tuff Products' pouch does not have slots. You just wrap the pouch around the belt and close it. 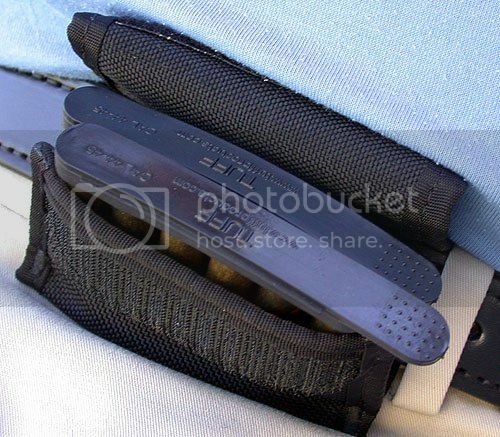 The back of what is the pouch's cover slides up behind the belt and over to close. 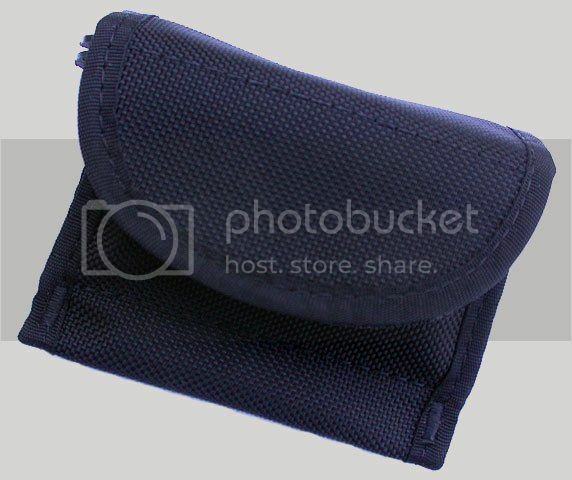 The pouch is quick and easy to remove without undoing the belt. 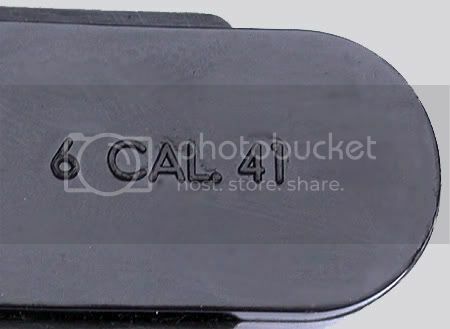 In this picture, you can see the two .44 Special-laden Quick Strips in the company's double pouch from the top. The pouch didn't accidentally lean open and dump the strips despite being open with the cover tucked behind the belt for better viewing of the two strips. Tuff Products states that this is due to their using "two military grade vertical bartacks." Now I wouldn't know a bartack if it bit me on the backside, but I think that these are what appear to be very heavy, vertical stitching on each end of the front of the pouch near the bottom. In any event, I didn't experience problems with the double pouches, spilling their strips when opened. I found that when practicing getting a Quick Strip at maximum speed, I sometimes accidentally grabbed both or got one while the other came out of the pouch and fell to the floor! I guess this comes from years of using only pouches capable of carrying but a single strip! I suspect that with practice, any similar "problems" can be overcome. If this is a concern, the company offers these pouches designed to carry one Quick Strip or just load one strip in the double pouch. 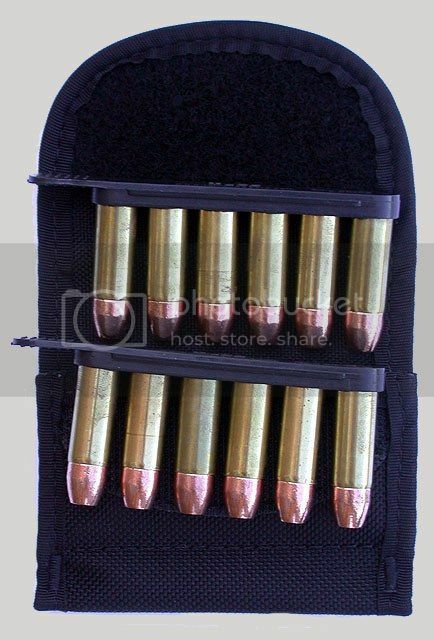 For decades now, using flat-profile ammo strips and carriers has been pretty much limited to .38's and .357's. With the introduction of Tuff Products' Quick Strips for larger calibers and now, the carry pouches, big-bore revolver fans are no longer left out. It is my understanding that a leather pouch for carrying Quick Strips is being considered by the folks at Tuff Products right now. Hello. The good folks at Tuff Products responded to the call for a .41 Magnum Quick Strip shortly after their .44/.45 series hit the market and I am happy to report that these will be available in the very, very near future. 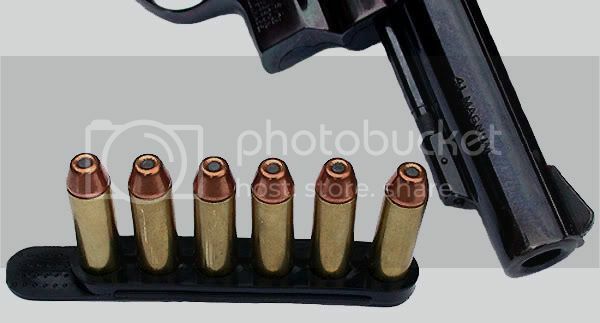 This Quick Reloading Strip is for the .41 Magnum and obviously holds six cartridges. I loaded this strip and carried it loose in Docker-type pants in a front pocket for 4 hours. All of the cartridges remained in the strip. Note the "bumps" on the tab at the end of the strip. They provide a very nice "grip" when using the strip. Of course there is no need to carry these strips loose since the company offers carrier pouches for them. 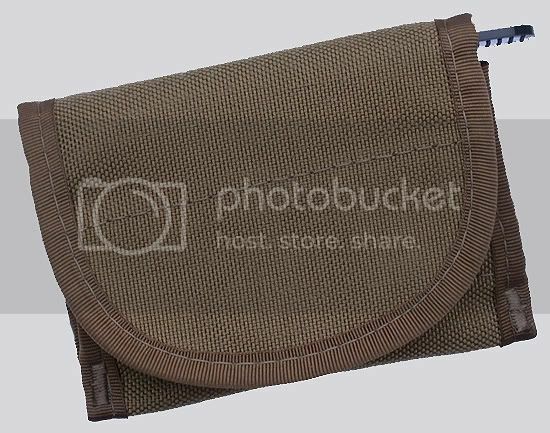 This pouch will hold two Tuff Quick Strips, but works fine with only one if you choose. It works just as great with the .41 Magnums as it did with .44 Specials and .45 Colt rounds. 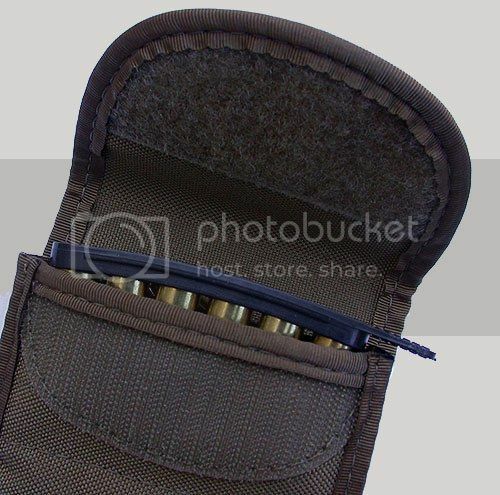 Closed, the Tuff Products ammo pouch is both secure on the belt and unobtrusive. This would be of less importance in the hunting field than would be the case in urban jungles where extra ammunition might need to be quickly at hand. If you already have the .44/.45 Strips, don't worry about getting them confused with those for the .41 Magnum. Tuff Products very neatly marks the appropriate ammo for their Quick Strip on its back. Nice touch in my opinion. 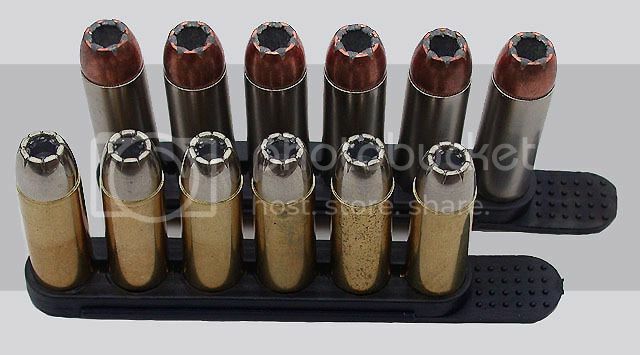 Tuff Products' Quick Reloading Strips are currently available for .44 Special/Magnum, .45 Colt, each holding six cartridges as well as one for .22 rimfire which holds ten and eight rounds in a strip for .327 Magnum. (It should be noted that the .44/.45 strips work with .410 Shotgun shells and the .460!) Other strips fit the following: .475 Linebaugh, .480 Ruger and the mighty .500 S&W. 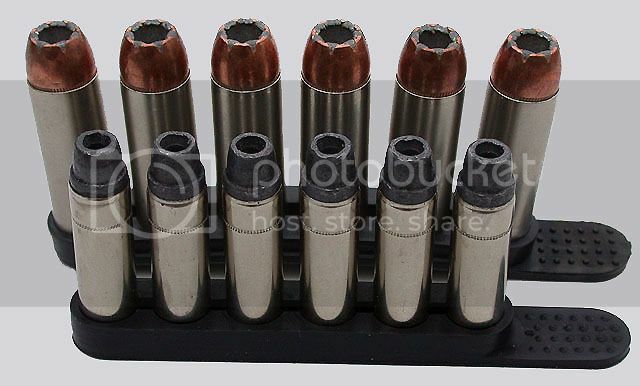 They are available in .38/.357 as well...but with eight rounds as opposed to the competition's six. The .41 Magnum strips are expected to be ready for sale around the middle of May as are strips for .45 Auto Rim! If you want to pre-order, a simple explanation is at Tuff Products' site and there is certainly no "requirement" to do so. Take a look at Tuff Products at www.tuffproducts.com for prices and other products you might be interested in. I am not associated with this company in any way but have to say that I've been very positively impressed with their Quick Strips and carry pouches. 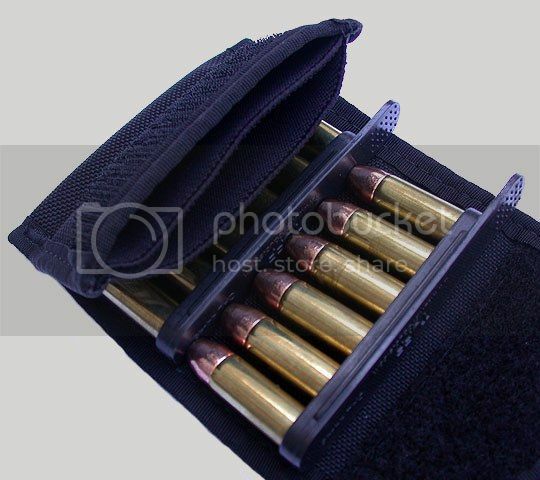 In my opinion, prices are not outlandish for the strips (two per package) and they simply do what they are supposed to do: carry conveniently and allow quicker reloading of extra revolver ammunition. I own but one .41 Magnum, a "shooter grade" S&W Model 58. Though I have a speedloader or two for it, I am very favorably impressed with Tuff Products' Quick Strips for it and will be using them in conjunction with their carry pouches in the future due to the "low profile" and convenience. 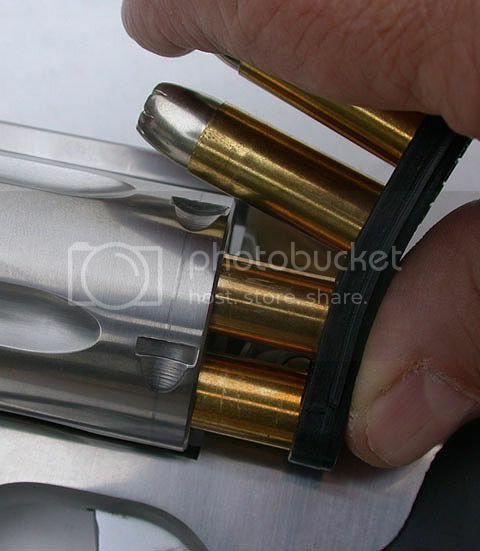 As a frequent revolver shooter/user, I appreciate having these reloading strips available in other than the .38/.357 version that has been around for decades.